ILYL | What Does ILYL Mean? ILYL means "I Love You Lots". ILYL is an expression most likely used between friends, rather than between loved-up couples. 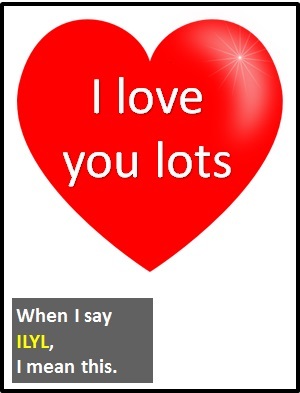 "I love you lots (ILYL)" has a casual, childlike sense - especially when followed with "like jelly tots" (as it sometimes is). It's also the sort of thing one might say when talking to a pet or when patting the bonnet of a new car affectionately. ILYL is also used as a farewell. I love you lots (ILYL) is something we might say to friends. Friend A: I've gotta run. See you tomorrow. ILYL. Friend B: Like jelly tots! Bye. Dog owner: You are such a good boy ILYL. Dog (thinks): Where's my treat then? ILYL is used as a standalone declarative sentence (i.e., a statement). In other words, it is not used as another part of speech within a wider sentence. Of note, as it is pronounced using its individual letters (i.e., "Aye El Wye El"), ILYL is classified as an initialism abbreviation. Initialisms are different to acronyms, which are spoken like words.